A rave funeral without the body. Musical Mechanical has recruited a rabble of mischievous northerners to form a traditional New Orleans Second Line. They expend their collective musical talent paying homage to the diehard days of the Hacienda, 90s club culture and its greatest hero, Mr Tony Wilson. These revolutionary genre bashers knock the First Line sideways, opting for up-beat, dance tracks over traditional slow hymns. 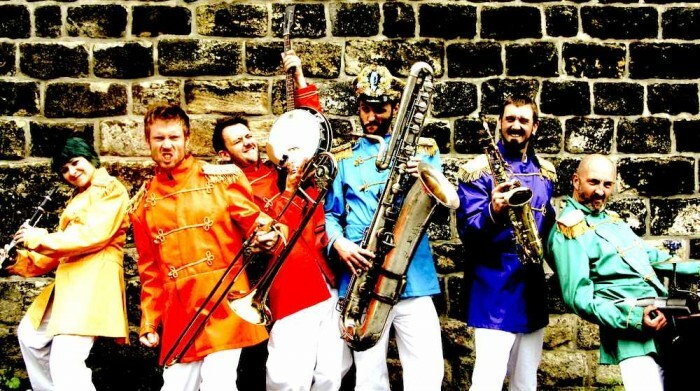 Proudly stepping out in uniformed style, they channel the spirit of the 24 hour party people and get audiences dancing where ever they play. The vision is an anarchic, street theatre extravaganza, bursting with colour and sound, rallying impromptu raves on street corners, rousing audiences young and old into a joyful frenzy.